Kalettes. A funny name for a serious vegetable. The Kale bit in the name comes from the fact they’ve been grown using tender kale. The ‘ettes’ bit in the name is because they ’re ever so small and cute. Not cute in a puppy kind of way, but more in a Brussels Sprout way. Because every little Kalette leaf has the crisp crunch of Kale with the nutty taste of a Sprout. What’s more, they contain the naturally grown goodness of both. So, if you’re looking for a new vegetable that’s packed with ‘good stuff’ and tastes great, then boy, have we got a vegetable for you. After all, as they say; good things do come in little packages. It’s not really a story, not in the fairy tale kind of way, but it does have a happy ending. Assuming you rush out and try some that is. Nearly twenty years ago, some very smart men and women decided they wanted to grow a new variant of kale. One that had even more taste and had done away with the hard stalk that kale often has. Now, these foodies, also happened to work for the seed house, Tozer Seeds. Very handy. Growing a new vegetable isn’t as easy as you may think. It can take an awful lot of trial and effort and even more patience. But eventually they hit on the perfect combination – kale crossed with Brussels sprouts. This blend allowed the best characteristics of each vegetable to shine. The crisp crunch of kale with the rich nutty favour of sprouts. It also looked good. Like a tiny cabbage with green frilly leaves and streaks of purple. 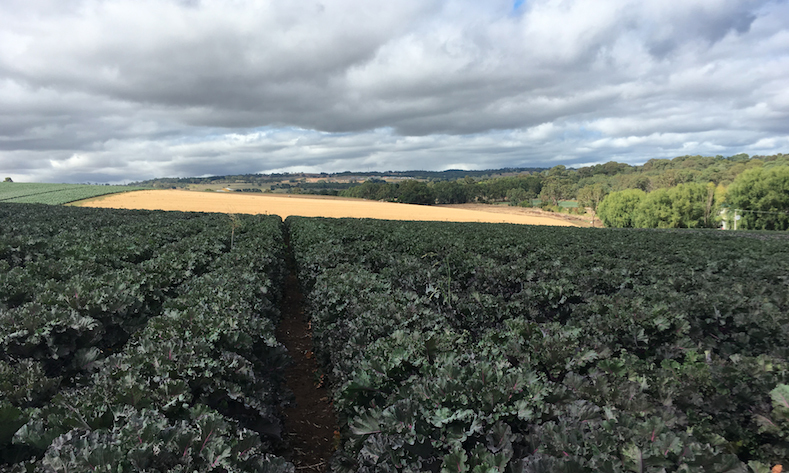 Today, Kalettes are showing the world that when it comes to vegetables, Britannia might not rule the waves, but we certainly rule the ploughed field. On cold evening days and nights, when you can’t be bothered to cook, but you want something packed with taste, this Kalettes, chorizo & sweet potato hash is the answer. It’s also easy to replace key ingredients if you’re vegetarian or vegan. These tarts are made for summer and picnics. Packed with flavour from the crumbly crust through to the cheesy, Kalettes filling these will become a firm favourite with everyone who tries them. As more and more people discover just how good we are, so you’ll find us everywhere. Not down the back of your sofa, but certainly in lots of shops. Since 2010 you could buy Kalettes in Marks and Spencer from November until March. If you’re wondering why we’re not on sale all year round, the answer’s simple. It’s because we’re grown naturally and locally and we’re a seasonal veg. Being seasonal is something we’re proud of as it means we’re growing vegetables the way they’re meant to be grown. But don’t worry about running out of Kalettes. Buy loads, then pop them in your freezer for use throughout the year. Now you’ll find us in a growing list (sorry about the pun) of retailers from Tesco to Waitrose. In fact, anywhere that prides itself on offering its customers the best food.